The main colors on the armor are complete as are the shoulder pad colors. Next is the trim detail, transfers for the shoulder pads, and the pack markings. So far, these miniatures have been fun to paint and I really like this pale blue-grey color I used. 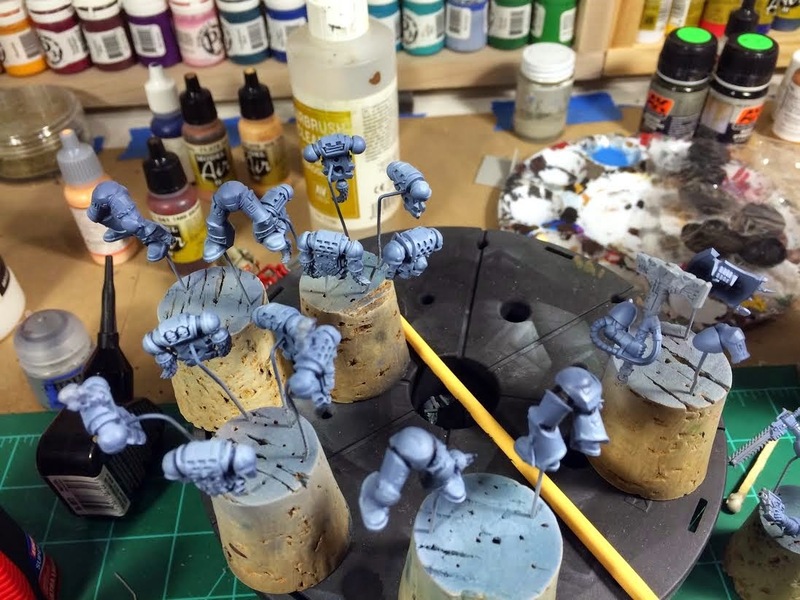 The armor was primed grey, basecoated with VGC Sombre Grey, and the highlights were accomplished by slowly adding VGC Wolf Grey into the Sombre Grey, finishing it off with pure Wolf Grey for the final highlight. 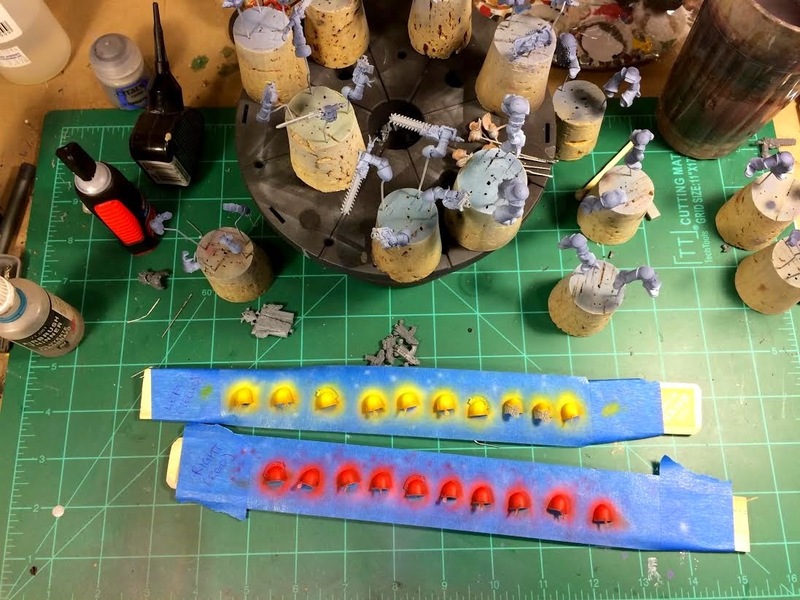 The yellow shoulder pads are primed white, basecoated with VMA Gold Yellow, shaded with VMA Burnt Umber, and highlighted with VMA Yellow over VMA White (to make the yellow brighter). The red shoulder pads were primed white, basecoated with VMA Italian Red, shaded with VMA Tank Brown, and highlighted with VMA Scarlet Red. The yellow pads will have the chapter logo and the red will have a black tribal design that I haven't decided on yet. 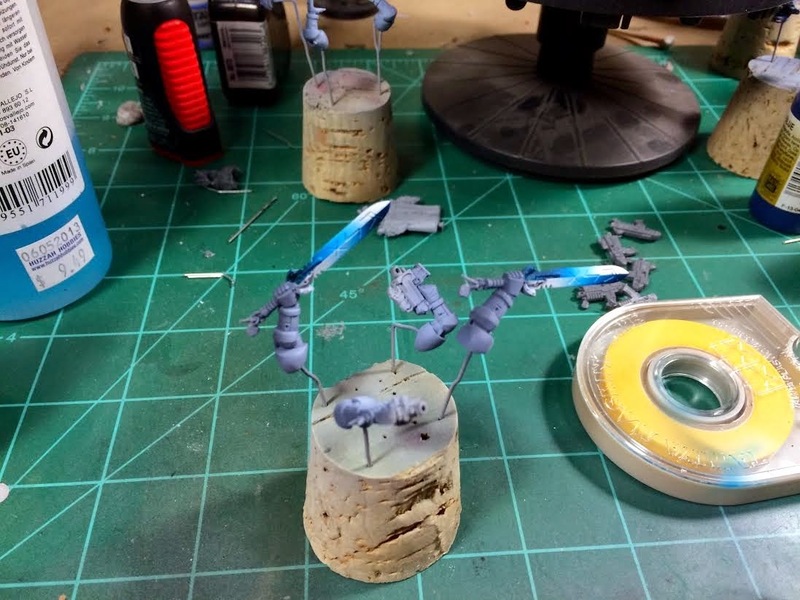 The Frost Blades were painted in my "standard" NMM power weapon scheme of white basecoat, VMA Light Blue, VMA French Blue, 1:1 mix of VMA Dark Sea Blue and VMA Black from lightest to dakest. I know this scheme is pretty much played out by now, but I still enjoy it and I think it will look quite nice on the completed model. Fantastic work on the swords man.